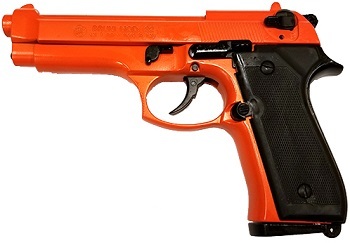 Image Below Or Add To Cart As an even safer and realistic alternative to live firearm training our 92 with new blaze orange finish ensures your training gun will not be confused for the real thing. Many people prefer that added safety The M92 classic modern military firearm is the type used by U.S. armed forces and Law Enforcement . Our 92 model features precision metal construction with authentic working single and double action. Release the clip, load the 8MM blanks, reattach the clip, pull back the slide and commence firing. The 92 blank gun is as seen in the movies, TV and used extensively in law enforcement, Military and private instruction Firearms training Features: Length: 8.5”, Weight: 2.7 lbs, Blank Ammunition, 8MM Blank Firing Cartridge, Finish: Orange with Black Grips.